My iPod is now running Linux (as well as the Apple Firmware of course). It doesn’t do much… yet… but I’m amazed at all it can do at this early stage. The recording function didn’t work though (kept getting a “can’t access /dev/dsp/” error). Hello Google Reviews! Where have you been all my life? Am I the only one creeped out by this image? First off, ventriloquist dummies are creepy. Secondly, it lookes like the dummy just eviscerated the poor laptop. 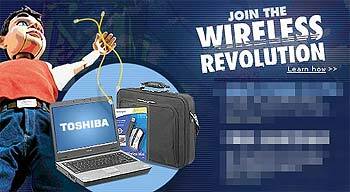 Thirdly, what does a ventriloquist dummy have to do with wireless? If it was a marionette… but it’s not. Game over Best Buy, try again? Update: Apparently it is a marionette, but as someone who doesn’t watch TV and hasn’t seen the commercials it’s hard to tell… and it’s still creepy! FYI- This post is 100% affiliate link free. Gosh. Unlimited bandwidth, a permanent archive, and automatic feed generation… all at a great price. LibSyn is doing PodCast hosting right. This would be perfect for churches who have limited web space and want to archive messages for more than a few months and not worry if a particular message gets too popular. Bluer is lucky enough that Limited Web Group donates plenty of disk space and bandwidth for our needs (thanks Trav!). Between this and DirCaster, I’m about ready to give up on my efforts (PHP script) to make podcasting easier for Churches- it appears to already have been done! The upgrade to WordPress 1.5 went pretty smoothly. Much easier than any Movable Type upgrade I’ve done. Note: Yeah, I know thw headers don’t match the background- I’ll fix that when I have time to re-export them all. You are currently browsing the the stuff in my head blog archives for February, 2005.